Ishmael ( ; ; ; , ) is a figure in the Hebrew Bible, and Qur'an. Jews, Christians and Muslims believe Ishmael is Abraham's eldest son and first born. Ishmael is born of Sarah's handmaiden Hagar ( ). Although born of Hagar, according to Mesopotamian law, Ishmael was credited as Sarah's son; a legal heir through marriage. ( ) According to the Genesis account, he died at the age of 137 ( ). Chapters 16–25 of the Book of Genesis contain the stories of Ishmael. Historians and academics in the fields of linguistics and source criticism believe that the stories of Ishmael belong to the three strata of J, or Yahwist source, the P, or Priestly source, and the E, or Elohist source (See Documentary hypothesis). For example, The narration in is of J type and the narration in is of E type. So Hagar returned to Abraham's house, and had a son whom she named Ishmael. Abraham was 86 years old when Ishmael was born. Abraham, obeying God's commandment, circumcised Ishmael, this occurred when Ishmael was thirteen. That year, Abraham's wife Sarah became pregnant with his second son, Isaac. One day Sarah was angered by seeing Ishmael mocking or playing with Isaac (the Hebrew word is ambiguous), and she asked Abraham to expel him and his mother, saying: "Get rid of that slave woman and her son, for that slave woman's son will never share in the inheritance with my son Isaac." Ishmael was very dear to Abraham. He initially refused to do as Sarah asked. He finally gave in to his wife's request when God told him that He would take care of Ishmael, since he was a descendant of Abraham. Abraham provided Hagar and her child with bread and a bottle of water and sent her into the desert of Paran. 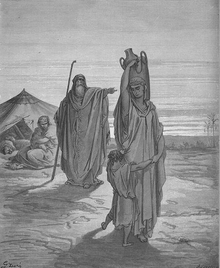 Hagar, with her son, wandered in the wilderness and ran out of water. When they were reduced to great distress, an angel appeared and showed Hagar a spring of water saying "What is the matter, Hagar? Do not be afraid; God has heard the boy crying as he lies there. Lift the boy up and take him by the hand, for I will make him into a great nation." They lived in the wilderness of Paran, where Hagar's son became an expert in archery. His mother married him to an Egyptian woman. According to the Bible, Ishmael had 12 sons who became twelve tribal chiefs. The twelve sons of Ishmael, were named Nebaioth, Kedar, Adbeel, Mibsam, Mishma, Dumah, Massa, Hadad, Tema, Jetur, Naphish, and Kedemah (See ) Ishmael's sons settled everywhere from Havilah to Shur, i.e. from Assyria to the border of Egypt. Ishmael also had a daughter named Mahalath or Bashemath who married Esau. Ishmael also appears with Isaac at the burial of Abraham. Ishmael died at the age of 137. That his descendants would live to the east of all his brothers Ishmael's brothers, other than Isaac, are found in . Among Abraham's other descendants are Medan (the father of the Medes) and Jokshan whose son was Dedan whose son was Asshurim (the father of the Assyrian people). An extra biblical book known as the book of Jubilees places the location and identity of the Ishmaelites as the Arab peoples residing in Arab territories. This is the current view for the majority of the Christian, Islamic and Jewish faiths, though according to Biblical accounts the Arab people traditionally have had long-standing alliances with the descendants of the Assyrians and the Medes. As well, the Arab populations in modernity represent many nations rather than one nation as specified biblically. Other references, such as the book of Jashar indicate that the Ishmaelites settled in Havilah which is located in Central India. 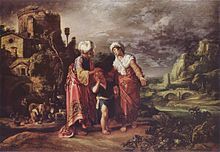 According to the Genesis account, Ishmael and his mother were expelled at the instigation of Sarah, in order to make sure that Isaac would be Abraham's heir. In the book of Galatians, Paul uses the incident "to symbolize the relationship between Judaism, the older but now rejected tradition, and Christianity." (Gal 4:21-31) In Galatians 4:28-31, Hagar is associated with the Sinai covenant, while Sarah is associated with the covenant of grace (into which her son Isaac enters). Ishmael ( Ismā'īl) is a prophet in Islam. The Qur'an considers him to be a son of Abraham. His name appears twelve times in the Qur'an mostly in lists with other prophets "as part of a litany of remembrances in which the pre-Islamic prophets are praised for their resolute steadfastness and obedience to God, often in the face of adversity." 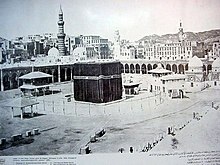 Picture of the Kaaba taken in 1880. Islamic traditions hold that the Kaaba was rebuilt by Abraham and Ishmael. Abraham and Ishmael are said to have built the foundations of the Kaaba ("They were raising the foundations of the House ", ). Islamic traditions hold that the Kaaba was first built by the first man, Adam. Abraham and Ishmael rebuilt the Kaaba on the old foundations. The Qur'an states that Abraham was commanded to sacrifice his son. The son is not named in the Qur'an (see ) and in early Islam, there was a controversy over the son's identity . However the belief that the son was Ishmael prevailed, and this view is continued to be endorsed by Muslim scholars. The argument of those Muslims who believed in the Ishmael theory was that "the promise to Sarah of Isaac followed by Jacob ( ) excluded the possibility of a sacrifice of Isaac." The other party held that the son of sacrifice was Isaac since "God's perfecting his mercy on Abraham and Isaac (in ) referred to his making Abraham his friend and saving him from the burning bush and to his rescuing Isaac.". The Bahá'í writings state that it was Ishmael, and not Isaac, who was the son that Abraham almost sacrificed. However, the Bahá'í writings also state that the name is unimportant as either could be used: the importance is that both were symbols of sacrifice. According to Shoghi Effendi, there has also been another Ishmael, this one a prophet of Israel , commonly known as Samuel. "Hagar." Encyclopædia Britannica. 2007. Encyclopædia Britannica Online. Certain Western scholars have suggested that Muhammad was not aware of this connection in the early period of his preaching. Their argument is that in the early verses of the Qur'an, Ishmael appears in lists mentioning prophets like Jonah, Lot and Idris without any association with Abraham. (e.g. see , , ). Reuven Firestone in Encyclopedia of the Qur'an says that there is some evidence to the contrary of claim of those western scholars. Bruce M Metzger and Michael D Coogan (1993), pp. 329 (Under 'Ishmael').